Markets were a bit skittish on Thursday, as U.S. equities pulled back off their early session highs. However, they rallied back to about flat on the day, as the dog days of summer continue to drag on. In light of that though, we’ve still had some big movers on our list of top stock trades. With that in mind, here are the top stocks investors should watch tomorrow. It’s just one explosive move after another with Advanced Micro Devices (NASDAQ:AMD). Luckily for InvestorPlace readers, they had a heads up on the breakout over $20. Now that AMD stock is up more than 10% from those levels, what should investors do? As the blue circle indicates, shares are now entering overbought territory. 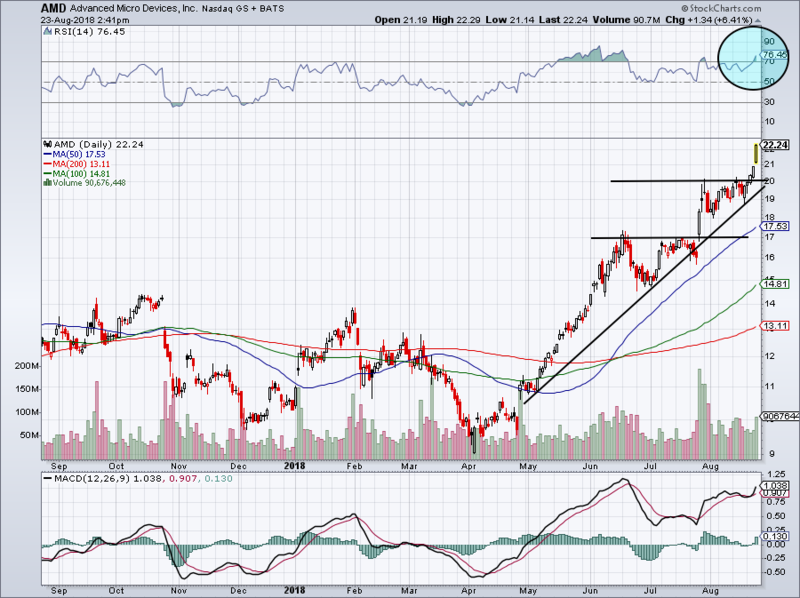 Given the rally in Nvidia (NASDAQ:NVDA) as well, it can obviously keep moving higher. However, I would be hesitant to enter AMD at this point. I would rather wait for a pullback to the breakout level between $20 to $20.50 or on a dip to uptrend support. This is another one that InvestorPlace readers had the heads up on. After getting the perfect buy-the-dip call in Alibaba (NYSE:BABA), we turned cautious on BABA on Thursday after its post-earnings rally. With downtrend resistance and all three major moving averages just above, the mid-$180s was not an optimal place to initiate a long position. So what now? Let’s see how BABA stock shakes out over the next few days. A retest of support or resistance could be in the cards at this point. After reportedly landing a deal with Alphabet (NASDAQ:GOOG, NASDAQ:GOOGL), FireEye (NASDAQ:FEYE) surged 7% Thursday. If you weren’t long before the rally though, be careful. 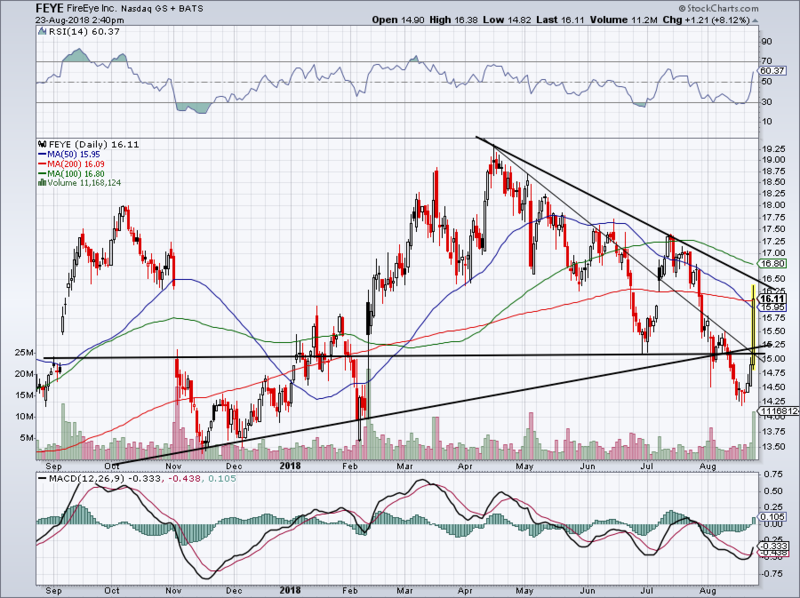 There’s downtrend resistance just ahead near $16.50 that FEYE has to get through before bulls can get truly excited. Aggressive bulls can stay long FEYE stock so long as it’s above its 50-day and 200-day moving averages. 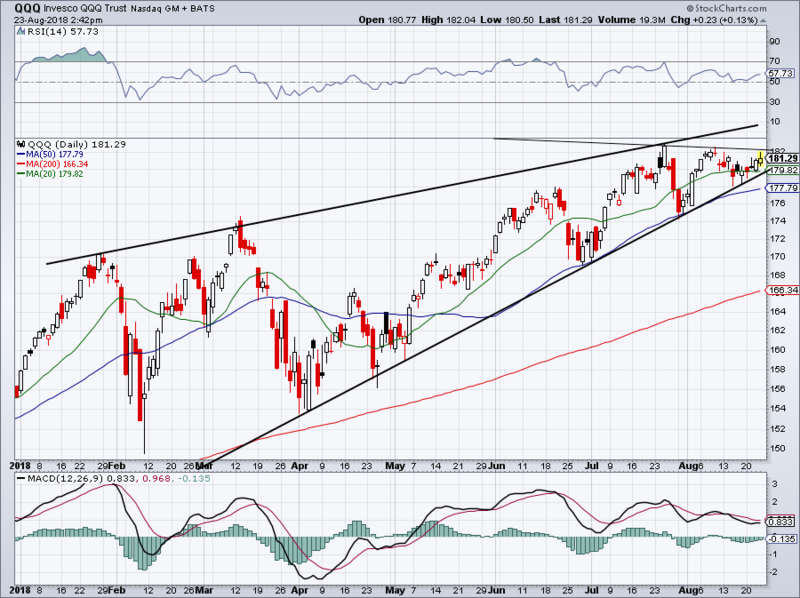 Otherwise, wait for a possible pullback or breakout. If all we traded on were headlines and our Twitter (NYSE:TWTR) feeds, you’d think we were entering a recession. Conversely though, we have U.S. equities hovering near all-time highs. 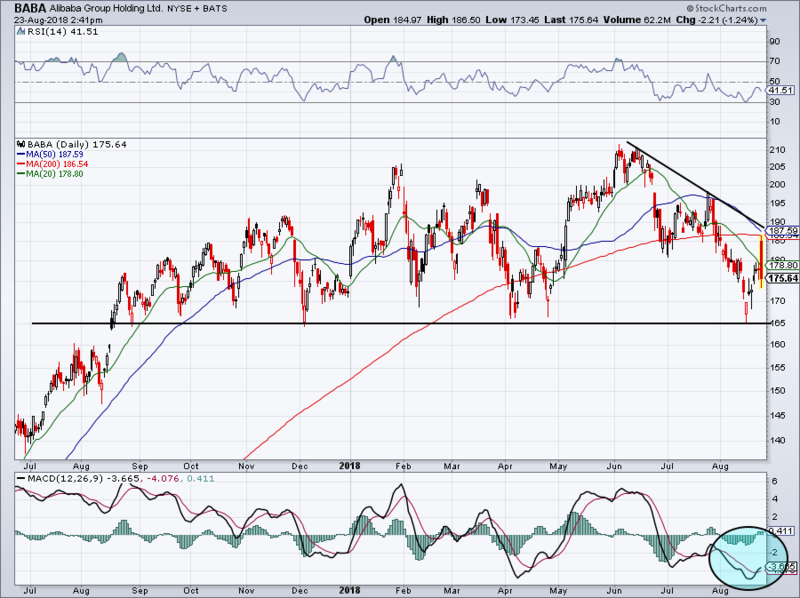 The PowerShares QQQ ETF (NASDAQ:QQQ) is no exception, as its July highs are just out of reach from current levels. 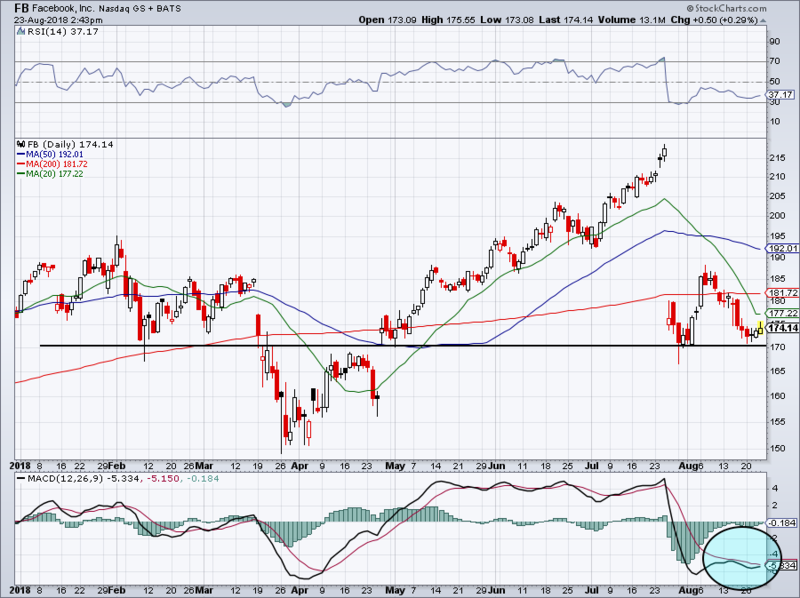 However, the QQQ ETF is in a solid uptrend and it is above all of its key moving averages. So long as that’s the case, I’d caution investors about becoming too bearish. Sure, the trend can break and we’re susceptible to minor pullbacks. But as it stands, there’s no reason to be overly negative in this environment. The most negative I’d be is cautiously bullish. Notice that the chart is not overbought and sentiment is not unsustainably high. A breakout over $182 could fuel a run to channel resistance, likely near $186 or so according to current measures. Last but not least is Facebook (NASDAQ:FB). The MACD (blue circle) shows that a shift back to bullish momentum could be taking place, giving FB stock a much-needed boost. After a rally from $170 to $188, Facebook stock has found itself right back near its post-earnings lows. The good news? Those levels are holding for now and that gives investors a solid risk/reward entry. Essentially, we can go long FB stock with a stop set at a close below ~$170. Anything above that and we can stay long. See how FB handles the 20-day though. If it’s resistance is too strong, support could give way and we may see its March lows again. Bret Kenwell is the manager and author of Future Blue Chips and is on Twitter @BretKenwell. As of this writing, he was long NVDA. Article printed from InvestorPlace Media, https://investorplace.com/2018/08/5-top-stock-trades-for-friday-amd-baba-qqq-fb-feye/.